We’d love your help. 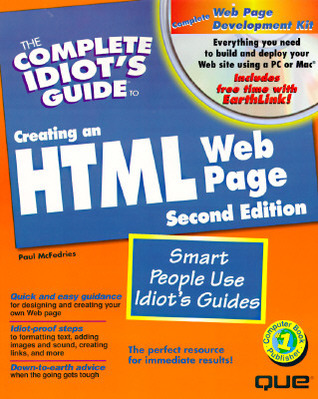 Let us know what’s wrong with this preview of The Complete Idiot's Guide to Creating HTML Web Page by Paul McFedries. Provides users with all the tools they need to create and customize their Web page. The text incorporates explanation and instruction with a light-hearted style of wit and humour. 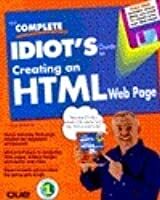 To ask other readers questions about The Complete Idiot's Guide to Creating HTML Web Page, please sign up. A bit dated at the point of reading (1999), with some of the "new features" old hat, and as well, some of the "old features" hade changed. However, the approach is light, and easy to follow, from beginning to end, and what makes this such a great resource is the CD-ROM disk that comes with it, containing some great software and sample coding to save the tired typist. I received no compensation, not even a free copy, in exchange for this review. I am not personal friends with the author, nor do I follow him / her on social media.